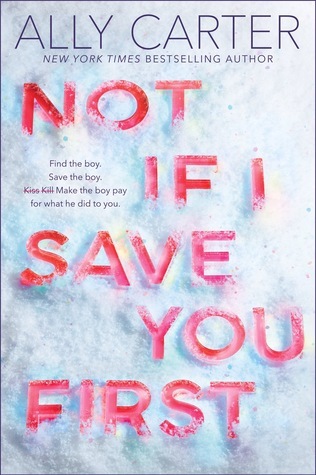 Review In A Nutshell: Not If I Save You First is a fun, lighthearted younger-YA book that’s easy to jump into and enjoy. Not If I Save You First follows Maddie and Logan, two ex-best friends who haven’t spoken for six years. When Logan is sent by his father, the President, to live with Maddie and her father in a remote Alaska cabin, he is followed by a killer. It’s up to Maddie to save him, despite how much she wishes she could kill him herself. The plot is very fast-paced, with plenty of suspense and action. The pages fly by, making for a really quick and lighthearted read. It’s not too deep or thought-provoking, but it’s definitely fun. The writing style is straightforward, favoring a bit more towards telling than showing, but is still enjoyable. This really isn’t a heavy, dark read. It’s quick, simple, and just a good time. The characters in this book were entertaining. They weren’t the most realistic people, but I still enjoyed their dialogue and interactions. Maddie is girly but tough, able to survive in a place that wants to kill you and making sure she looks good while doing it. Logan is smart, loyal, and a bit naive. Their banter is fun, and their relationship cute. While they aren’t the most down to earth people, I still enjoyed reading from their perspectives and seeing how they handle the situations they get into. Not If I Save You First is a great book for someone looking for something fun and quick to enjoy.